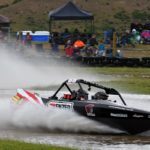 The cancellation of round two of the Altherm Jetsprint championships in Featherston due to dry weather has a hidden silver lining for some teams. Due to run on December 2, the event may have to be run later in the season at a different track. But that could be good for the very competitive Glen Head, expected to feature heavily on the podium this season until back surgery over the winter. Having prepped the ENZED SuperBoat for this weekend, Caughey’s Sprintec crew are now busily putting the final touches to an exciting new Group A boat for a fast-charging client keen to contest the NZ Champs. That’s the silver lining in a frustrating announcement for not only the teams involved, but the Featherston officials. It’s likely the jetsprint racing body will add an extra round to the calendar to keep the total events to six, but it’s possible they may announce the title after five rounds, or add an extra round at one of the existing tracks into the calendar.